Everyone has a 9/11 story. No matter who you are, or where you were, that moment and the aftermath is indelibly etched in everyone's mind. The thing I remember most about being at work that day, besides the obvious, is that our Senior Adults were in for their weekly group which helped get our newsletters in the mail. We noticed that they were all so calm as they worked. Unlike all the rest of us - we were frantically calling family, some of us were crying, all of us praying. We realized that they were calm because they had LIVED through this before. They had Pearl Harbor! So to them, this was tragic, but not unknown. To us, it was unbelievable that terrorists had come to America and done this! I also remember waking up the next morning - when I opened my eyes I thought, oh my gosh, what an awful nightmare. Seconds later, I remembered it wasn't a dream at all - it was our new reality. Share your 9/11 memories in the comments below, if you'd like. With no understanding of what has happened and is happening around them, these fives are forced to band together and fight against all odds to escape from the impending horrific collapse. During these critical minutes, a story of courage, faith, and the will to live unfolds. Find out more about the movie here. 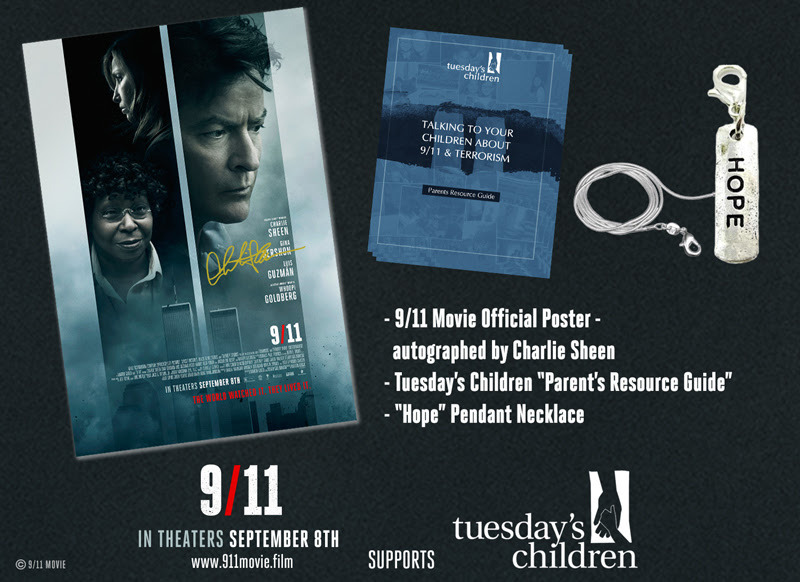 I am giving away a #Remember9/11 Gift Pack that includes a signed poster from Charlie Sheen, a parent's resource guide and a Hope necklace. Click the Rafflecopter widget below to enter the giveaway! 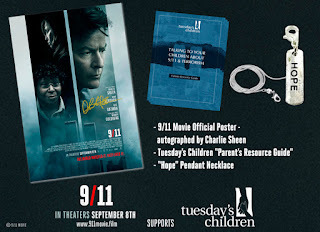 I am working with 9/11 Movie to promote the movie, and they supplied these materials and the prize pack (one for me, one for one of my readers). No other compensation was received. I was at work when the news broke about the plane crash. I was working at a nursing home and remember the staff going into the bedrooms of the residents to watch the news. We were all siting watching the news together. I was young and the resident's room I was in explained the magnitude of what was going on, all while tears ran down her face. I will never forget that moment. I was at home with a newborn when it happened.